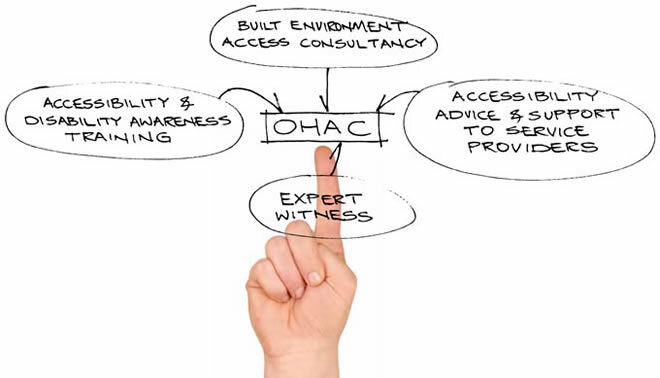 O’Herlihy Access Consultancy (OHAC) is one of the leading specialists in access consultancy and training in Ireland. Established in 2007, our goal is to make services and buildings accessible for everyone. We work in partnership with national and international clients to ensure that their built environment, services, human resources and information provision are accessible to all staff and customers regardless of age, size or disability. OHAC has advised clients including the National Disability Authority, the European Commission; Dublin Castle, Cantrell and Crowley Architects; the Health Service Executive; University College Cork; the Department of Education and Skills; Donal T. Ryan Solicitors; John Sisk and Sons; European Network for Accessible Tourism; National Standards Authority of Ireland; Microsoft; the Irish Wheelchair Association; Age Friendly Ireland; Kennedy Wilson; Dublin City Council; Henry J Lyons Architects; Dublin Institute of Technology and the Department of Environment, Community and Local Government. We offer in-house built environment access consultancy services with experience working in the Commercial; Residential & Housing; Retail and Mixed; Healthcare; Hospitality and Leisure; Industrial; Educational; Conservation and Civic sectors. We ensure that environments, whether new or existing, are designed and managed to address the needs of all people who will use them. We provide specialist disability equality and awareness training tailored to meet your requirements of organisations. Our accredited trainers offer a wide range of training courses in three areas of accessibility: customer services, information provision and the built environment to support organisations in making their buildings, information, facilities and services accessible to all. We offer accessibility advice and support to service providers across a wide range of sectors including the Tourism; Transport; Housing; Education; Health Care; Public; Voluntary and Private sectors. This ensures that all people working in or using the services of the organisiation can maximise their own individual abilities, and can have full, equal, confident, independent and safe participation within that organisation. We act as an Expert Witness and work with your legal teams to provide professional insight and advice on a range of accessibility or disability access issues ranging from housing accommodation needs reports, compliance with relevant accessibility Building Regulations and best practice guidelines.